With war drawing to a close, attention in the U.S. State Department increasingly turned toward the design of the United Nations, the jewel in the crown of the postwar American Lebensraum and the fulcrum on which the second moment of the American Century balanced. Disabling Germany and shaking loose the colonies for U.S. trade inevitably involved compromise with the larger goal of immunizing the global economy from local, geographically rooted squabbles; territorial considerations were a necessary evil if geography was to be taken out of the postwar political equation. It was otherwise with the United Nations. As Roosevelt and the State Department contemplated its design, they could give full vent to their ambition for a global organization devoted to securing a "permanent peace." They knew they had a second chance at Woodrow Wilson's "global Monroe Doctrine" and a more realistic version of the League of Nations, and they were determined to avoid Wilson's mistakes. This is not at all to say that the UN was designed out of pure altruism. Hastened on the one hand by war and by the fear that the 1930s depression would return after the war, when no longer staved off by military mobilization, and on the other hand by a recognition of the expanded scale of economic production and the proliferation of U.S. multinational interests, Roosevelt in the early 1940s voiced the ambition of global power more clearly than any U.S. president ever had. This vision only became sharper as the war continued and the unprecedented scale of U.S. postwar political and economic power came into view. Therefore, although Roosevelt and the State Department sometimes disagreed on the details, they clearly understood the United Nations' role as a pivotal institution for postwar U.S. globalism. High-sounding rhetoric about global peace simultaneously conveyed a more self-interested ambition for global political and military stability so that economic growth could continue unhampered. The UN was to be the organization that successfully absorbed and displaced local territorial and political conflicts, decoupled them from the free operation of a world market in which the United States inevitably dominated. Unlike any of its predecessors, the American Empire was to be market based. That Secretary of State Dean Acheson should have exalted Bowman as one of the "architects of the United Nations" has a certain irony1—not because the praise was unworthy, but because as Bowman's own amalgam of nationalism and conservatism grew more brittle after 1944, he remained thoroughly committed to building an institution that became a lightning rod for reactionary American nationalists. While he barked at the New Deal for attracting "the lunatic fringe of social progress,"2 pilloried the U.S. government as the major threat to freedom in domestic social affairs, and excoriated any whiff of federal intrusion into free enterprise science, he remained an internationalist and devoted his deepest political hopes and energies to the establishment of the UN, which, to many Americans in this period, was akin to world government, the emasculation of the nation, the ultimate political evil. It is tempting to see Bowman's unswerving commitment to the UN as simply the residue of a lost liberalism, the remnants of a Wilsonianism otherwise cuckolded by the fervent conservative nationalism unleashed toward war's end. But that misreads Bowman and Wilson both, insofar as Bowman, like many aging Wilsonians, easily donned much of the same conservative nationalism. It was a nationalism that in no way denied his internationalism but lay coiled within it. Thus the story of the UN's origins is generally told as a distillation, liberally or conservatively inflected, of just such political dichotomies—nationalism versus internationalism, liberalism versus conservatism, idealism versus pragmatism—slipping toward cold war conflict.3 This orthodoxy already expresses a distinctly American postgeographic ambition, whereas if the origins of the UN are reread through the lenses of a contested global geography, a very different vision emerges. The central dilemma faced by U.S. postwar planners was how to design a global organization that followed broadly democratic principles and recognized certain universal rights, regardless of geography, while ensuring as best they could that this organization would work for their own nationally defined interests. To be sure, the same dilemma was faced by all other national governments, but insofar as the United Nations was designed first and foremost within the State Department, the question of U.S. power is paramount. In the end, the abstraction from geography proved unsustainable, and the contradiction between universality (a world beyond geography) and particularity could be resolved or at least rationalized only by a resort to partisan political geographies. Far from escaping geography, the UN became its prisoner. The geographies built into the structure of the postwar United Nations are alive and multidimensional, mutable and partial, and the story of these constitutive geographies provides a sharp etching of the central contradictions not so much of globalism per se but of twentieth-century U.S. globalism in particular, as it evolved from Wilson to Roosevelt and beyond. It is not that particularism won out over universalism, nationalism over internationalism, but rather that a nationally specific and quite prejudicial internationalism defined the core of what the UN became. In the United Nations the second moment of American globalism came face to face with its own contradictions. "The Unhappy Past": Beyond Geography? The postgeographic ambition of Roosevelt's new world order embodied in the UN did not spring onto the global diplomatic stage full grown. As late as August 1941, Roosevelt was reticent even in private about anything smacking of a revived League of Nations, arguing to Churchill that such an organization would be futile and that the United States and the United Kingdom would simply have to run the world themselves. He rebuffed more ambitious appeals from his advisers and eliminated from the Atlantic Charter the original British call for an "effective international organization" in favor of weaker, noncommittal language. Still, it was Roosevelt at the end of 1941 who coined the name "United Nations" in the final edit of the United Nations Declaration,4 although at this point the label referred not to an organization but to the "associated powers" opposing Germany, Japan, and their allies. An American Empire, constructed over the last century, long ago overtook European colonialism, and it has been widely assumed that the new globalism it espoused took us "beyond geography." 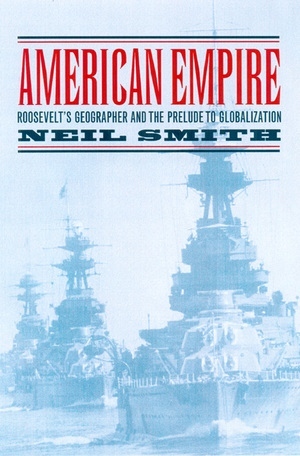 Neil Smith debunks that assumption, offering an incisive argument that American globalism had a distinct geography and was pieced together as part of a powerful geographical vision. The power of geography did not die with the twilight of European colonialism, but it did change fundamentally. That the inauguration of the American Century brought a loss of public geographical sensibility in the United States was itself a political symptom of the emerging empire. This book provides a vital geographical-historical context for understanding the power and limits of contemporary globalization, which can now be seen as representing the third of three distinct historical moments of U.S. global ambition. The story unfolds through a decisive account of the career of Isaiah Bowman (1878–1950), the most famous American geographer of the twentieth century. For nearly four decades Bowman operated around the vortex of state power, working to bring an American order to the global landscape. An explorer on the famous Machu Picchu expedition of 1911 who came to be known first as "Woodrow Wilson’s geographer," and later as Frankin D. Roosevelt’s, Bowman was present at the creation of U.S. liberal foreign policy. A quarter-century later, Bowman was at the center of Roosevelt’s State Department, concerned with the disposition of Germany and heightened U.S. access to European colonies; he was described by Dean Acheson as a key "architect of the United Nations." In that period he was a leader in American science, served as president of Johns Hopkins University, and became an early and vociferous cold warrior. A complicated, contradictory, and at times controversial figure who was very much in the public eye, he appeared on the cover of Time magazine. Bowman’s career as a geographer in an era when the value of geography was deeply questioned provides a unique window into the contradictory uses of geographical knowledge in the construction of the American Empire. Smith’s historical excavation reveals, in broad strokes yet with lively detail, that today's American-inspired globalization springs not from the 1980s but from two earlier moments in 1919 and 1945, both of which ended in failure. By recharting the geography of this history, Smith brings the politics—and the limits—of contemporary globalization sharply into focus. Neil Smith is Distinguished Professor of Anthropology and Geography and Director of the Center for Place, Culture and Politics at the Graduate Center, City University of New York. His recent books include Uneven Development (1990) and New Urban Frontier (1996).